Freedom – Eat anything you want without restriction, just like you would with natural teeth. What’s the first thing you’re going to enjoy eating once you’ve received your new teeth? Permanence – Unlike bridges, crowns, and dentures which typically last only 5 to 10 years, the All-On-Four procedure in Flossmoor and Homewood, L, can give you a smile that will last a lifetime. Simplicity – Taking care of your new smile won’t require any fancy tools or techniques. You’ll simply brush and floss as you would with natural teeth. Just don’t forget to visit us twice a year for regular cleanings! Confidence – Say goodbye to the days when you hesitated to smile or show your teeth. All-On-Four is a game changer! Impress your family, friends, and coworkers with a dazzling new smile and experience newfound self-confidence in all your interactions with others. What Is All-On-Four in Flossmoor and Homewood, IL? The All-On-4 procedure is, simply put, an amazing and potentially permanent solution for all your dental needs. With it, you can replace your full set of upper and lower teeth by using only four implants – as opposed to earlier treatments that required an implant for every missing tooth. 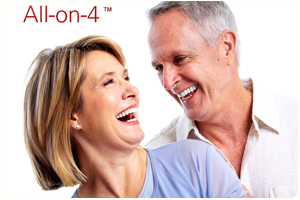 All-On-4 can give you the naturally beautiful smile you’ve always dreamed about! With only four implants, you will experience a chewing force that matches that of natural teeth. All-On-4 is frequently referred to as “teeth in one day,” because the entire procedure can be completed in just a single visit! What’s involved in the All-On-4 procedure? We use state-of-the-art technology to analyze key information about you. We’ll take X-rays, impressions, and panoramic scans to create a complete profile. Based on the information we obtain, we then customize a treatment plan for your unique case. During the procedure itself, we provide you with a full set of natural-looking teeth that are secured into place with four titanium implants. The sedation you receive ensures that the process is entirely painless. The implants and your new teeth will be placed, all in a single day. You will go home at the end of the day with a brand new, radiant smile. Just imagine it! Once you return home, you’ll be surprised by how quickly you start enjoying life with your new smile. In some cases, patients have told us they were eating their favorite foods as quickly as 24 hours after they received their new teeth! At The Center for Dental Excellence, we have been treating patients of all ages with All-On-Four in Flossmoor and Homewood, IL, ever since this procedure first became available over 15 years ago. Our finely-tuned skills and extensive expertise ensure that you’re in the best hands and will enjoy the best possible outcome. The time is right to treat yourself to a smile that will improve your health and change your life. You deserve it! Call or contact us at 708.798.1234 today to schedule your Free Consultation.